These pictures don't give them justice. They are beautiful when done! I am advocating the use of Corn Syrup. Surprised? Don't be. This was a darling craft done in Ellery's kindergarten class this fall. As I gushed about them to her teacher, she admitted they were her favorite craft all year. 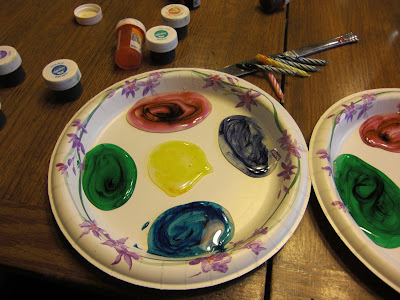 They painted cardstock leaves with corn syrup. Results...glossy, fall stained leaves. I was sold. We added a winter twist to ours. I drove Callista crazy the entire time we did this because I kept trying to help. "Mooommm Doooon't!" was oft repeated. Trust me on this, these are gorgeous. The pictures do not do them justice. Try it and I promise you won't be disappointed. 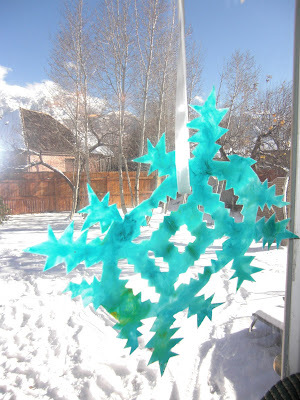 Cut snowflakes (or whatever shape your heart desires) out of cardstock. 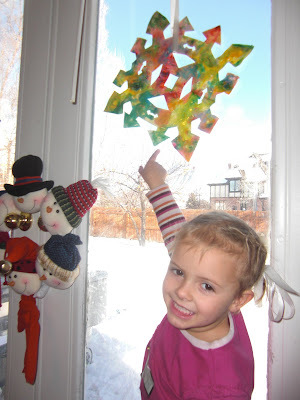 We did large snowflakes to hang in our windows, but I think little ones would make neat little Christmas ornaments. Swirl food coloring into corn syrup. 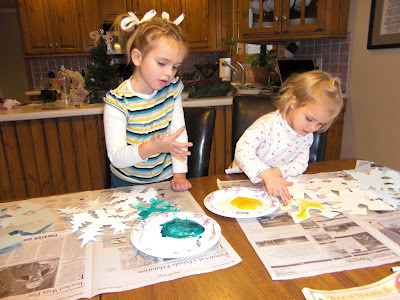 Mix glitter in if desired, or you can dust with glitter while the corn syrup is still wet. Let sit until hard. This requires a few days, beware! Repeat process on the back side, if desired. String ribbon through and enjoy! They will drip if they get wet, so watch out for that.